Confused or not confident with selecting youth soccer equipment? Whether you are searching for “must-have” Soccer cleats, Soccer ball and Shin guards or any other youth or adult soccer equipment… you will find here all need-to-know information to make the best selection suitable for you. My goal is to assist you with making an ultimate choice, when buying equipment for soccer, hoping that I can save you time, money and…headache. Learn everything you need to know to purchase youth soccer equipment that is right for you (or your daughter/son). Right for your age, level of soccer you play and right for your (or your parent)…budget. It's FREE. No strings attached. Note: Don't worry - your e-mail address is totally secure. I promise not to share it with anyone. I hate spam too. What should we base our selection on? What factors determine the right choice? Perhaps combination of them all? There are probably as many online soccer stores as types of soccer cleats. This made me realize that finding valuable, respectful and reliable place to buy soccer equipment could be as hard as choosing one properly. Therefore I've created a list of online soccer stores that I've experienced doing business with and know they are secure sites with quality merchandise and customer service. Categorized Real-Time Soccer Equipment Auctions before making a purchase anywhere else. I always do. 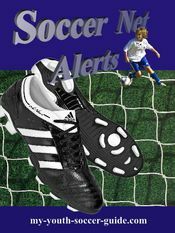 For members of Soccer Net Alerts only. Not a member yet? Subcribe here, it's FREE. Sale for Soccer gathers the most valuable current discounts, promotions, special offers, coupons and clearance on soccer equipment from around the net. All reviews, tips and hints I have based on my experience in soccer, opinion of my fellow soccer players and detailed research on youth soccer equipment. I played youth and adult soccer in Europe. Despite the age I still have fun with soccer by playing in adult amateur leagues in US. And I am also a soccer parent. My 2 teenage boys give me a great deal of insides on today’s youth soccer equipment. Would you like to share your knowledge about youth soccer equipment? Contribute to www.my-youth-soccer-guide.com!